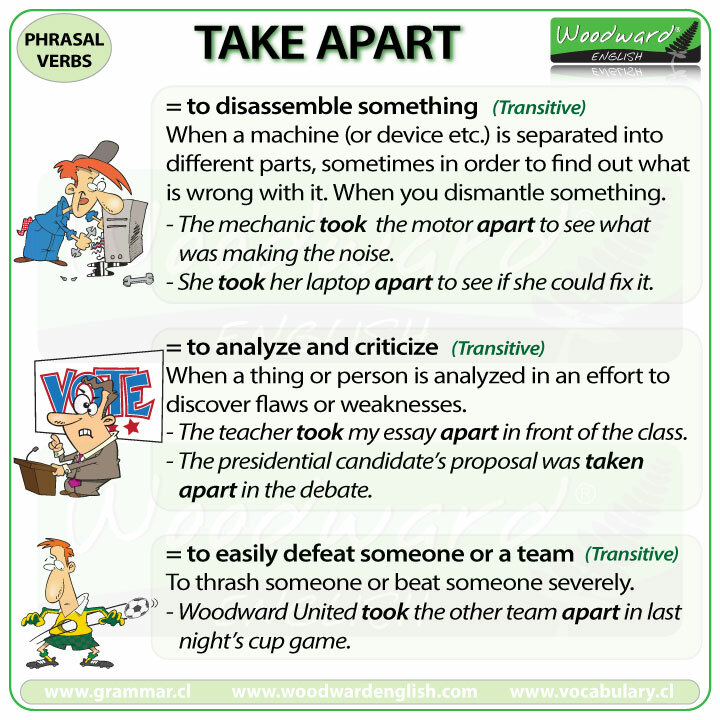 (transitive) This phrasal verb is used when you dismantle something into its component pieces. It is when a machine (or device etc.) is separated into different parts, sometimes in order to find out what is wrong with it. Disassemble and dismantle are synonyms of take apart. The mechanic had to take the motor apart to see what was making the noise. They had to take the bed apart because it wouldn’t fit through the door. She took her laptop apart to see if she could fix it. When you are in the army, you learn how to take your gun apart very quickly. I took my bike apart to give it a good clean. He easily took his watch apart but he couldn’t put it back together again. (transitive – informal) This is used when somebody talks about the different parts of something (such as of a novel or movie) in order to criticize it. The thing or person is usually analyzed in an effort to discover flaws or weaknesses. The presidential candidate’s proposal was taken apart in the debate. The critics took the new play apart and left terrible reviews. My teacher took my essay apart by saying all the things that were wrong with it. My boss took apart the budget I had made by saying it was too costly for the company. (transitive – informal) It is another way of saying to thrash someone or to beat someone severely. Woodward United took the other team apart in last night’s cup game. We lost by a huge margin. Their team really took us apart. The All Blacks took the Wallabies apart in the classic Trans-Tasman rugby match.